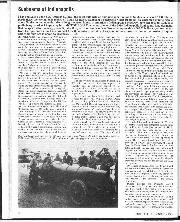 I have prevailed upon Mr. Anthony S. Heal, the great authority on anything appertaining to Sunbeam cars and STD affairs, particularly the racing endeavours of Louis Coatalen, Sunbeam's celebrated Chief Engineer, to write this erudite article about Sunbeam racing undertaken a long way from home, at America's Indianapolis Speedway, between 1913 to 1921, as a preliminary to what I hope may be a Motor Sport account of one of the 1919 Indianapolis Sunbeams, long dormant, that is expected to re-emerge, rebuilt, later this year. For Sunbeam's of Wolverhampton those 500 Mile Races, contested far from Europe, were a bold venture and how their entries faired is of especial interest now that one of the Wolverhampton cars from that era is about to reappear. — Ed. Brooklands was opened in 1907 and its value to the motor industry as a testing ground was soon demonstrated. Napier, Vauxhall, Talbot, Sunbeam and others made good use of the track for developing their products and they derived considerable publicity from their racing successes there. In the United States the need for a similar testing ground was also appreciated. Four successful Indianapolis businessmen, Carl C. Fischer, James A. Allison, A. C. Newby and Frank H. Wheeler decided to build a "motor speedway" where motor manufacturers could test their products to the maximum limits of speed and endurance. It was opened in the summer of 1909 and at the first calamitous meeting on August 19th there were several accidents in which five people lost their lives. The macadam surface of the track was unsuitable for the speeds attained. The owners decided to re-surface the entire 2-1/2 mile circuit with paving bricks, a job which they tackled themselves in a typically American, highly organised, fashion. 3,200,000 bricks were laid and grouted in 63 days. The Speedway was re-opened on December 18th with a successful, accident free, meeting despite the freezing temperature. Strang, with his 120 h.p. FIAT, set up a new 5 Mile Record in 3 min. 17.7 sec. — a foretaste of things to come. The first of the famous series of 500 Mile Races was held in 1911. Although FIAT and Mercedes cars with American drivers took part, the first European works entries were not attracted until 1913, when Peugeot entered two cars to be driven by Jules Goux, and Paul Zuccarelli. These machines were basically the successful 7.6-litre Grand Prix cars of 1912 with specially cast cylinder blocks, 2 mm. smaller in the bore (108 nun.) to reduce their cubic capacity within the 450 cubic inch limit. At Indianapolis informed opinion expected the Peugeots to be the fastest cars in the race, but was convinced that they would not last the 500 mile 'grind' on the brick-surfaced Speedway which demanded staying power of a very high order. This latter quality was one which Louis Coatalen had managed to develop in his Sunbeam cars which had set long distance records at Brooklands at speeds which compared favourably with that achieved by Dawson's National, the winner of the 1912 Indianapolis 500. The performance of the Sunbeam 3-litre "voiturettes", which finished third, fourth and fifth in the 1912 two-day Grand Prix, showed that their little side-valve engines had the staying power, even if they could not match the top speed of the 7.6-litre Peugeots. The opportuntity of challenging Peugeot in a 500 mile race on the Speedway appealed to Coatalen and he bethought himself of the two-year-old six-cylinder car which had set 15 World Records from 4 Hours to 12 Hours at 75 m.p.h. in 1911. Since then it had been further developed and towards the end of the 1912 season Dario Resta drove it, setting up World Records for 50 Miles, 100 Miles and 1 Hour at over 92 m.p.h. There seemed to be a sporting chance that this car, known as "Toodles IV", might well have the right combination of speed and staying power to be successful at Indianapolis, despite its age and lack of cubic inches. Albert Guyot was selected to drive this first British entry in the "500". Built originally in 1911 as a basically standard 25/30 h.p. model, its 6 cylinders were cast in two blocks of three (90 x 160) giving a capacity of 6,107 c.c. The side valves were operated by a camshaft on the near side. The single Claudel carburetter was on the offside. The engine was carried on a sub-frame with three point mounting on the chassis. It drove through a cone clutch to a separate four speed gearbox and bevel rear axle. The rear springs were three-quarter elliptic and Rudge Whitworth wire wheels were fitted. The wheelbase was 11 ft. 1in. For the 12 Hour Record a single seater body was fitted with the radiator mounted separately from the bonnet so that the air flow did not pass into the engine compartment. For Indianapolis a shorter wheelbase (10 ft. 7 in.) and half elliptic rear springs were used. A two seat body, similar to the Coupe de'L'Auto' voiturettes, was fitted with an extended cowl over the radiator. The 33 gallon petrol tank was shaped to merge into the streamline shape of the body. For sustained high speeds engine cooling was carefully considered — to minimise loss of water a coil of copper pipe above the filler cap acted as a condenser. A dry sump lubrication system was used and to cool the oil a couple of 1-1/2-inch diameter exposed copper pipes ran along outside the body from the engine to the 4 gallon oil tank in the tail. Oil pressure was 25 psi. Steel pistons, machined from a solid billet, as was the usual Sunbeam practice, were fitted. Hanford and Triou shock absorbers were used in conjunction and artillery type wheels, with central hub nuts, were equipped with Dunlop tyres. Two sizes were apparently used, 34" x 4," and 32" x 4-1/2". According to the American journal, Motor Age, the smaller size was used on the rear wheels. The car's weight is given as 2,300 lb. The rebuilding and modification of "Toodles IV" seems to have been completed in good time, for in February Louis Coatalen and R. H. S. Grossman, who had both driven it in the successful 12 Hour Record attempt in 1911, took the car to Brooklands for test. Despite an obstruction on the track Crossman lapped at 94 m.p.h. The car was shipped from Liverpool to arrive ahead of Guyot and Crossman, who sailed fmm Le Havre aboard "La Provence" on May 10th. Although the car had been rebuilt and prepared for the race at the Sunbeam works and R. H. Crossman, a member of the firm's staff, was to act as engineer and racing mechanic, the Company issued an announcement that Guyot's entry was a private one and the car was not being run by them. On arrival at Indianapolis the Peugeot and Sunbeam teams were impressed by the Speedway organisation and the helpfulness of the officials. The National Company, whose car, driven by Dawson, had won the race the previous year, put their factory at the disposal of the foreign competitors. During practice the Peugeots proved themselves to be faster than most, but it was felt that it was unlikely they would last the course. The American teams regarded the Sunbeam and Mercedes-Knight with more concern. The day of the race was extremely hot. Oil and rubber made the brick surface slippery and marshals repeatedly spread chloride of lime on the track at the corners. Goux's Peugeot took the lead early in the race, but lost it through tyre trouble. Tyres were the limiting factor and Goux found that 82 m.p.h. was quite fast enough for his Firestones. Zuccarelli had the misfortune to suffer a broken petrol pipe which resulted in his Peugeot catching fire. 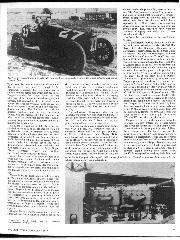 Guyot found the long wheelbase of the Sunbeam a disadvantage on the corners, but resolved to drive to finish in the money. He saved his tyres and had to change only three rear tyres, two offside and one near side, during the race. The Sunbeam ran with the greatest regularity and the only mechanical trouble was the sticking of a hub retaining nut when one of the wheel changes was made. Goux's winning Peugeot wore out seven tyres and lost 11 minutes due to pit stops. At 40 miles Guyot was in 8th place, but had climbed to 3rd at 80 miles. He was 4th from 120 to 200 miles when he dropped to 6th, which position he held until after 400 miles had been completed. In the last 100 miles he rose to 5th and finally finished in 4th place having averaged 70.92 m.p.h. Only four drivers drove the whole distance; spare drivers and relief mechanics took over most cars during the race, but Goux, Guyot, Pilette (Mercedes Knight) and Mulford (Mercedes) drove from start to finish. Guyot slowed towards the end of the race as he could not wipe out the 15 minute lead that the third place man, Merz (Stutz), had. As he entered his last lap the customary green flag was shown, but he misunderstood the signal and, thinking he had finished the race, he toured round on his last lap. 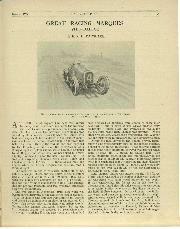 Massac Buist, the forthright journalist, writing in The Autocar, was critical of Guyot's tactics for the Sunbeam was never really extended nor given the chance to demonstrate its speed. He also criticised the pit organisation and the lack of pit signals. Guyot told W. F. Bradley* after the race that the Sunbeam depot nearly ran out of petrol and was rescued by the generosity of Disbrow, the Case driver, who got his helpers to carry cans of Petrol to the Sunbeam pit. This was a particularly sporting act as Guyot's retirement would have enabled Disbrow's car, which finished 7th, to gain a place. Despite Massac Buist's accusation it must be admitted that Guyot achieved what he set out to do. He nursed his two-year-old car and its tyres to finish 4th in the race, without mechanical breakdown, and he won 3,500 dollars. It was a gruelling race in intense heat. He told W. F. Bradley that he had never driven in such trying conditions. His head reeled, the sole of one boot was worn through by the pedal and it raised a blister on his heel. The vibration caused by the brick surface gave rise to pipes breaking and tanks leaking. The unfortunate Crossman, who rode as mechanic the whole way, was a well built man. He had to squeeze himself into the narrow seat as best he could and after the 7 hour race he was practically unable to move for two days. The whole expedition, as a private entry with a two year old car, was obviously run on a shoestring. Guyot and Crossman put up a very creditable performance, but Massac Buist complained that the Americans imagined that it was an official works entry with the full backing of the Sunbeam Motor Company. "I had scarcely landed in New York," he continued, "before one of the most prominent dealers told me that if the car would win the race he would place a firm order, with deposit, for 500 Sunbeam cars, no matter whether the present duty were reduced or not. The American motor public loves a winner, and does not mind what its country of origin. I found it impossible to convince most of my friends out there that the car, which has a reputation in the United States equal to anything it has been enjoying in Europe, was being run as a private entry. They wanted to know what the Sunbeam Company was doing not to take America seriously." Perhaps there is a moral in this story for us to-day. The Indianapolis capacity limitation of 450 cu. in., which was maintained for the 1914 500 Mile Race, left the Sunbeam Company at a considerable disadvantage. In 1912 their 3-litre "Voiturette", with its side-valve engine, had been successful in the Coupe de "L'Auto" road race, but in 1913 the 16 valve twin overhead camshaft Peugeot had proved unbeatable. The Grand Prix at Amiens earlier in the 1913 season had been run on a limited fuel allowance with no limit on engine capacity. Sunbeam's approach to the problem had been to build a 4-1/2-litre 6 cylinder engine (80 x 150 mm.) based on their 1912 4 cylinder "Voiturette". It gave 110 b.h.p. at 3000 r.p.m. Peugeot produced a scaled-up version of their Coupe de "L'Auto" engine (100 x 180) 5.6-litres, and Delage designed a 7-litre 4 cylinder with 16 push-rod operated horizontal valves, reminiscent of their 1911 Coupe de "L'Auto" winner. The fuel limitation proved to be a great leveller. The Sunbeam, with the smallest engine of the three, finished led behind two Peugeots and ahead of two Delages. In October one of these 6 cylinder Sunbeams was fitted with a single seater body and set up 36 World Records at Brooklands from 250 kilometres to 12 Hours. The 500 Mile Record was taken at 94.74 m.p.h. (20 m.p.h. faster than "Toodles IV" over the same distance). Despite its relatively smaller cubic capacity, the Sunbeam Company entered one of these Grand Prix 6 cylinder cars for the 1914 Indianapolis race. It was fitted with the engine from the 12 Hour Record single seater. The four corners and the short straights of the 2-1/2 mile Speedway put a premium on acceleration. Twin Claudel Hobson carburetters were fitted and efforts were made to minimise weight. A special gear box with only two speeds was made and a 3 to 1 axle ratio was used in place of 2.5 to 1 used in the Grand Prix. To improve engine cooling twin water outlet manifolds were provided on the cylinder head and dry sump lubrication was used with an oil tank mounted transversely behind the bolster petrol tank. Jean Chassagne, who had brought his Sunbeam into third place in the Grand Prix at Amiens, was nominated to drive at Indianapolis and he was again accompanied by his mechanic Percy Mitchell. In addition to this official entry by the Sunbeam Company, another 1913 six cylinder Grand Prix Sunbeam was entered by the American driver Harry Grant, who had purchased the car early in the year. Two Peugeots, to be driven by Jules Goux and Georges Boillot, and two Delages for R. Thomas and Albert Guyot, were entered by their manufacturers. Rather to the annoyance of the official Peugeot team, Arthur Duray entered a litde 3-litre Coupe de "L'Auto" Peugeot which he had borrowed from its private owner, Jacques Meunier, the French chocolate manufacturer. The larger capacity of the French cars gave them a considerable advantage in speed, but Chassagne was lapping at 80 m.p.h. and at 40 miles he lay 13th, 6 sec. behind Boillot, but 11 sec. ahead of Goux. Grant was 20 seconds behind his team mate driving to his customary predetermined lap speed. On his 20th lap Chassagne had his off-side rear tyre burst and the car skidded up the banking, tearing the tyre off the rim. After spinning round twice, the rear wheel crumpled when it slid on to the soft ground of the infield and the Sunbeam overturned, throwing Mitchell out. Chassagne retained his seat and apart from a cut face he was unhurt. Michell landed in some long grass without serious injury. After changing the rear wheel the Sunbeam was able to be driven back to the pits under its own power, but was withdrawn from the race. Spare wheels were not allowed by race regulations to be carried on the cars. Harry Grant, who had twice won the Vanderbilt Cup Race in 1909 and 1910, by steady consistent driving, ran to his predetermined schedule. He was in 15th place at 100 miles, climbing to 12th at 220 miles, 10th at 300 miles and at 400 miles he lay 7th which position beheld until the finish, having averaged 75.68 m.p.h. The Sunbeam ran steadily and consistently throughout, but the French cars, with their superior speed, completely dominated the race. Thomas's Delage won at 82.47 m.p.h., but the big surprise was the performance of the little 3-litre Peugeot driven by Duray who finished second at 80.99 m.p.h. ahead of Guyot's Delage and Goux's Peugeot. It was clear that in America, as in Europe, the day of the side-valve engine in international motor racing was over. Nobody realised this better than Louis Coatalen. The twin cam 16 valve engine was predominant, so Sunbeam had to follow suit if they were to stay in the game. As is now well known, he acquired a 3-litre Coupe de L'Auto Peugeot and brought it to Wolverhampton for close study. From this were evolved two new teams of racing cars for the 1914 season — 3.3-litre for the RAC Tourist Trophy Race and a 4-1/2-litre for the French Grand Prix. The former, which was victorious in the Isle of Man race, bore a very close resemblance to the Peugeot but the Grand Prix car, although clearly influenced by the work of Ernest Henry and the Peugeot "Charlatans", showed some points of difference. Like Peugeot, the two piece crankshaft was carried on three ball bearings and a train of gears at the front of the cast iron cylinder block drove the two overhead camshafts, which operated the two inlet and two exhaust valves in each cylinder. The valve included angle was 60 degrees. An improvement was made to the valve gear. In place of the Peugeot's F shape tappets, light pivoted cam followers were used. The bore and stroke were increased to 94 mm. x 160 mm. (4,441 c.c.) and the well tried Sunbeam steel pistons, with central strut supporting the crown, giving a compression ratio of 5.27 to 1, were employed. Twin Claudel Hobson carburetters were fitted and the engine gave 108 b.h.p. at 2,800 r.p.m. Dario Resta finished 5th in the Grand Prix at Lyon averaging 62.46 m.p.h. K. Lee Guinness had to retire on his 10th lap due to a broken piston and J. Chassagne had a big-end give way on the 13th lap. Both the winning Mercedes cars and the Peugeots were clearly faster than the Sunbeams. The outbreak of War in August 1914 brought an end to motor racing in Europe, but in America there were prospects for a busier season than usual in 1915. The success of the Indianapolis Speedway had encouraged the construction of new tracks at Sheepshead Bay, New York, Chicago and Cincinatti. The reduction of the capacity limit to 300 cu. in. for the Indianapolis 500 was thought to benefit European constructors but most of them were too fully occupied on war work to undertake the design and construction of new racing cars. Drivers too were otherwise engaged, Albert Guyot was in the trenches, Georges Boillot and Jules Goux were engaged on military transport, Arthur Duray was on Headquarters Staff and Jean Chassagne was working in the Aviation Department of the Sunbeam Motor Car Company. Nevertheless two of the 1914 Grand Prix Sunbeams were entered although there was some doubt as to who would drive them. Jean Porporato, an Italian, who had driven the fastest Minerva in the TT race, was nominated and he took one of the Sunbeams to Brooklands for tests. Even by mid May the second driver had not been definitely decided. Eventually "N. Graham" was announced as the Driver of the second Sunbeam but this "nom de course" failed to conceal the identity of Noel van Raalte. Due to heavy rain the race was postponed from Saturday to Monday which was cool and dry. The Peugeot and Mercedes duel at Lyon was re-enacted with Dario Resta (1914 G. P. Peugeot) and Ralph de Palma (1914 G. P. Mercedes) fighting for the lead for 340 miles when Resta suffered a burst tyre, skidded and damaged his steering, but after changing all four wheels he continued at only slightly slower speed. De Palma then held his lead until the finish but three laps from the end he had a connecting rod "let go''. He managed to complete the remaining laps with a hole in the crankcase. He averaged 89.84 m.p.h. Resta was only 3 min. 32 sec. behind. The most interesting feature of the race was the performance of the new 16 valve Stutz cars. Wilcox led the race for 4 laps shortly after the start when his team mate, Gil Anderson, overtook him and held the lead for 70 miles. He finished third having averaged 87.6 m.p.h. Cooper on a sister car was fourth and Wilcox was seventh, all three in the money. The Sunbeams had a very disappointing race. Porporato was lapping at a respectable 90 m.p.h. but was delayed by broken bonnet straps which he had to stop to repair. He was lying 5th at 400 miles when a piston seized due to a broken piston ring. Van Raalte, despite his inexperience, was holding 7th place up to half distance, but he suffered a succession of exasperating mishaps. He had to change two plugs and then lost his bonnet, which he was instructed to retrieve, and this lost him a lot of time. Later the bracket, on which the magneto was mounted, came loose and he lost 16 minutes. An hour later the same thing happened and he rectified the trouble in 10 minutes. In total it was estimated that he spent nearly an hour at the pits but he doggedly kept going eventually finishing 10th (and last) but nevertheless just in the prize money (1,400 dollars), having averaged 75.79 m.p.h. Grant's 1913 side-valve Grand Prix Sunbeam was outclassed by the more modern machinery. He was lapping at about 80 m.p.h. when he was called in to repair a broken brake connection. He continued until near the end of the race when he was again called in to fix up the undershield which had came loose. He withdrew having completed 184 laps. 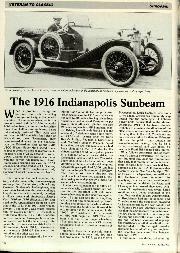 The American journal, The Automobile, described the performance of the three Sunbeams as "a little disappointing". Their disappointment must have been shared by many people in Wolverhampton. Ever since their first Transatlantic venture in 1913, Sunbeams had endeavoured to compete with cars having a cylinder capacity considerably below the maximum allowed by the regulations. For three years they had raced against more powerful cars with larger engines. Towards the end of 1915 Josef Christiaens, who was an expert on Claudel carburetters, joined Sunbeams in Wolverhampton. He had driven the Belgian Excelsior in the 1913 Grand Prix at Amiens and in the 1914 500 Mile Race at Indianapolis where he finished sixth. 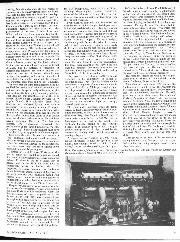 He suggested to Louis Coatalen that Sunbeams should build a six-cylinder engine of 4.9-litres, to be fitted into the 1914 Sunbeam Grand Prix chassis, which should be really competitive at Indianapolis and other American track events to be run in 1916 under the new 300 cubic inch rule. Despite the Company's pre-occupation with the production of aero engines, two cars were built on the lines Christiaens had suggested. When the first descripton of them was published in the Autocar of April 29th 1916 it was represented that the engines had been built before the Grand Prix at Lyon in 1914 but, due to pressure on the Racing Department in preparing teams of cars for the Tourist Trophy and the Grand Prix, the development of the six-cylinder engines had been shelved. The dimensions were given as 80 x 150 mm. but in later years at Brooklands they were always stated as 81.5 x 157 mm. 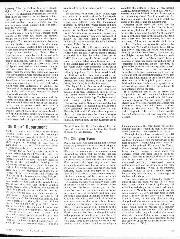 The American Automobile Journal, in a tabulated list of particulars of competitors published just before the 1916 Sweepstakes, quoted 3.21 x 6.25 ins. Although these engines showed considerable traces of the influence of Ernest Henry in their design, there were a number of departures from the Peugeot tradition. Twin overhead camshafts and four valves per cylinder with an included angle of 60 degrees were in line with established practice, but the camshaft casings were each in one piece instead of being split horizontally. Pivoted cam followers carried by bronze mountings were used in place of the earlier F-shaped tappets. To save weight, aluminium panels formed the sides of the water jackets and aluminium pistons, extensively drilled, were used for the first time on a Sunbeam racing car. The cylinders were cast in two blocks of three. The ports were smooth internally and sharp corners were avoided. Twin Claudel CZS carburetters and water jacketed induction manifolds were fitted to improve acceleration. The three piece crankshaft was curried on four large ball bearings. Dry sump lubrication was provided. These engines were built and tested by Frank Bill, a skilled fitter, and a boy. They gave over 150 b.h.p. at 3,200 r.p.m. and continued to be competitive in racing at Brooklands until 1929. The six-cylinder engine necessitated a longer sub-frame when mounted in the Grand Prix chassis. All the petrol and oil pipes were duplicated and sheathed in rubber, a lesson learned from Zucarelli's unfortunate experience in 1913. A four speed gearbox was normally used but a lighter two speed box was made, intended for use on the American high speed steeply banked board tracks. 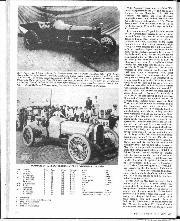 The six-cylinder Sunbeam made its debut, driven by Josef Christiaens with Frank Bill as his riding mechanic, on May 13th at the new track at Sheepshead Bay, New York in a 20 mile race. It was a useful try-out before the 300 Mile Race at Indianapolis at the end of the month. The Sunbeam finished second to Jack Aitken's Peugeot at an average speed of 104.11 m.p.h. despite damage to an oil pipe, caused by the rev-counter coming adrift, which resulted in running a big-end. A serious engine vibration at 3,000 r.p.m. caused Christiaens to limit his speed to 2,900 r.p.m., fast enough, he felt, to finish "in the money", rather than risk smashing up the engine. Before the Indianapolis race Frank Bill changed the axle ratio and made a number of adjustments in the light of experience at Sheepshead Bay. Some trouble was experienced with the tyres, which he was persuaded by Barney Oldfield to fit, but after changing to Goodrich the problem was overcome. During the race Christiaens had to make only one stop to change tyres which was done in 30 sec. The race was won by Dario Resta in his 4-1/2-litre Peugeot. The Sunbeam finished fourth at 79.66 m.p.h., winning 3,000 dollars. Despite the handicap imposed by the engine vibration, Christiaens took part in a number of races at several tracks during the remainder of the season. After Indianapolis the Chicago International Derby was held on a new banked track with Peugeot, Mercedes and Sunbeam as the principal participants. With the death of George Boillot fresh in people's minds (he had tackled five German Fokkers single handed in his Nieuport scout near Verdun), the memory of his epic drive at Lyon in 1914 most have been revived by the 300 mile duel between Dario Resta (Peugeot) and Ralph de Palma (Mercedes). This time the French car won at 98.7 m.p.h. Christiaens was third at 95.78 and Galvin, on the second Sunbeam, fourth at 94.54 m.p.h. With their rev limit set at 2,900 r.p.m., the Sunbeams were unable to beat the Peugeots and Mercedes and some of the new 16 valve American cars, like Duesenberg, Premier and Maxwell, gave them a run for their money. The wisdom of Christiaen's tactics in playing safe was shown when on September 9th at the last meeting of the season at the Indianapolis Speedway, Galvin's car was entrusted to Louis Chevrolet. Frank Bill rode with him and he drove for all he was worth. Lying third behind Hughie Hughes (Hoskins), Chevrolet was determined to overtake him and on the last lap, when just about to do so, the rev-counter was showing 3,200 r.p.m. There was a clatter and a connecting rod came throagh the side of the crankcase. The Sunbeam crossed the finishing line half a second behind Hughes having averaged 91.79 m.p.h. and having won 400 dollars! This proved to be Frank Bill's last race as a riding mechanic and five years were to elapse before a Sunbeam racing car again competed in an American event. With America's entry into the Great War, motor racing ceased in the USA as it had done in Europe. But on November 11th 1918 the Arrnistice was signed and soon afterwards preparations were put in hand for the first postwar 500 Mile Race at Indianapolis — "The Victory Sweepstakes". 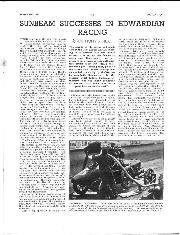 The rules were to be the same as for the last race in 1916, with a capacity limit of 300 cubic ins. It is now a matter of legend that on Christmas Eve 1918 Ernest Ballot decided to enters team of cars and Ernest Henry was instructed to start the design on Boxing Day. Despite all the industrial problems in France, occasioned by the change from war to peace, four entirely new straight eight racing cars were designed and built from scratch in 101 days and were shipped to America on April 26th. For once fortune seemed to have favoured the Sunbeam Company, for had they not got two racing cars, built to the 300 cu. in. formula, which had already been tried and tested in 1916? At Christiaen's suggestion the six-cylinder 4.9-litre engines had been fitted into the shorter chassis used for the Tourist Trophy race. The cars were prepared in good time, but on February 23rd 1919 fate struck a staggering blow. Josef Christiaens was giving a demonstration of the newly rebuilt racing car to the Directors of the Company on the road outside the Sunbeam works when he hit the kerb and the car overturned. Christiaens was killed and his faithful mechanic was seriously injured. He walked with a crutch for the rest of his life. Entries for three cars had already been made on January 13th and early in May two of the cars arrived at the Speedway. Resta and Chassagne were nominated as the drivers. Louis Coatalen himself arrived in New York on April 28th en route to Indianapolis. But the Sunbeams were never submitted for scrutineering. Nor were they officially timed in the eliminating time trials and on May 20th they were withdrawn without any explanation. 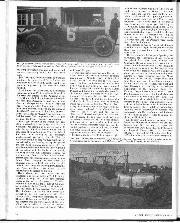 Motor Age reported on May 1st that "the two Sunbeam racing cars have not yet been tried out for extreme speed owing to the fact that they are too fast to be run over the roads and there is no suitable test track at the present time in England. Brooklands track has been badly torn up because of heavy haulage done over it by trucks running into and out of a large aviation field which was maintained there during the war". By May 15th the same journal said "Prevailing opinion at present is that Dario Resta and his new Sunbeam will be the ruling favourite", but two days before the race on May 31st they expressed the opinion that the speed of the straight eight Ballots and of Ralph de Palma's Packard "was not entirely unconnected with the decision on the part of Coatalen to withdraw the two Sunbeams". That the cars were capable of matching the speed of the Ballots can be seen by reference to their speeds at Brooklands in 1922 when Zborowski lapped at 114.49 m.p.h. and Segrave in the Indianapolis Sunbeam at 115.82 m.p.h. These cars continued to perform competitively in the hands of many other drivers until 1929 so they cannot be said to have been lacking in power or speed. For the 1920 500 Mile Race the capacity limit was reduced to 183 cu. in. which, fortunately, coincided with the three-litre limit which was being adopted for Grand Prix races in Europe. To comply with this new regulation Ernest Ballot produced a new team of three-litre straight eight racing cars, designed by Ernest Henry, which took second, fifth and seventh places at Indianapolis. There were no Sunbeam entries for the 1920 race but early in 1921 Louis Coatalen entered three cars, two Sunbeams and one Talbot Darracq. Like the Ballots they were straight eights, 65 x 112 mm., with four valves per cylinder. The aluminium cylinders had shrunk-in steel liners and were cast in two blocks of four. The tulip-shape valves were operated by two overhead camshafts through inverted cup type cam followers, which eliminated all side thrust from the valve stems. As on the 1916 six-cylinder engines, the camshafts were driven by a train of straight tooth pinions at the front but, unlike the previous design, the five main bearings and the big-ends were plain. The crankshaft was counter-balanced and no flywheel was fitted. The dry sump lubrication system employed two oil pumps, a rather more positive arrangement than the single pump system devised by Ernest Henry. Experiments were made both with two and with four carburetters. Four horizontal ClaudeIs were used at Indianapolis. With 5.7 to 1 compression 108 b.h.p. was developed at 4,000 r.p.m. Delco coil ignition was used and a dynamo on thc near side was driven from the timing gears. The engine, with the multi-plate clutch and separate four-speed gearbox, were mounted as before on a sub-frame carried on the chassis at three points. To achieve a low centre of gravity, the chassis frame was upswept over front and back axles, which were both underslung. In addition, the front end of the engine was lowered so that the line of the crankshaft and transmission sloped downwards towards the front. One car was built as an experiment with the chassis and body off-set on its axles to the near side to enable the left hand bends of the Speedway to be taken at greater speed. After tests at Brooklands the idea seems to have been dropped. Double Hartford shock absorbers were fitted to each spring and rather small brake drums, on the rear wheels only, were used together with a transmission brake. Straight side tyres, 32 x 4-1/2, were fitted to the front wheels and 33 x 5 to the rear. No less than ten of these 3-litre straight eight cars were put in hand — three for Indianapolis and seven for the Grand Prix de l'ACF. The road racing cars differed from the Indianapolis machines in having four wheel brakes and two vertical Claudel carburetters. Three of them were entered for the Grand Prix as Talbot Darracqs, two as Talbots and two as Sunbeams. Apart from the "badge engineering" they were distinguished mainly by different shaped radiators. At Indianapolis two cars carried the name Sunbeam and one, Talbot Darracq. Early in March H. O. D. Segrave and A. Divo took the experimental car with the offset chassis to Brooklands for test. It proved rather a handful on the right hand bend by Vickers Sheds. At the BARC Easter meeting the 3-litre straight eight made its public debut when Segrave won the 3-litre Scratch Race at 94.64 m.p.h. 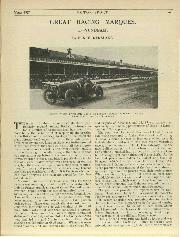 Rene Thomas and André Boillot were nominated as drivers of two of the cars for the Indianapolis race and it was evidently hoped that Dario Resta would handle the third car as his name was printed in the programme. 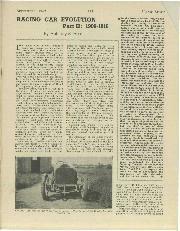 In the event Boillot drove the Talbot Darracq and René Thomas, with an American driver, Ora Haibe, drove the Sunbeams. The day of the 9th International Sweepstakes was fine and Ralph de Palma with his 3-litre Ballot dotninated the race, lapping at 93 m.p.h. for 112 laps. Andre Boillot's Talbot Darracq broke a connecting rod on his 41st lap. The Ballot retired with bearing trouble leaving R. Sarles (Duesenberg) and T. Milton (Frontenac) duelling for the lead. René Thomas held third place until a water connection broke on his 144th lap. Ora Haibe lay fifth until 350 miles when he gained a place, but was overtaken by Jimmy Murphy (Duesenberg) in the last lap of the race. The Sunbeam finished fifth, the only European car to complete the distance, 3 min. 21 sec. behind Murphy, having averaged 83.86 m.p.h. Out of 23 starters only nine finished the race. As an augury for the coming Grand Prix it seemed that the Sunbeams would be hard put to it to match the speed of the Ballots and the Duesenbergs. Armchair critics might well hold that the Sunbeam achievements at the "Hoosier Bowl" were not very brilliant. From the tabulation it will be seen that a Sunbeam finished "in the money" in each of the five races in which the marque took part. There were five retirements, four due to mechanical failure and one as the result of an accident. The best placing was 4th, achieved by both Guyot (1913) and Christiaens (1916). Of the nine drivers only one, van Raalte, was English. Four of the others were French, two American, one Belgian and one Italian. The fact that only one of the nine drivers (Harry Grant) drove a Sunbeam in more than one race must have proved something of a handicap, for the "Speedway" is quite unlike any other track or any ordinary road. European drivers take time to accustom themselves to the local conditions and to learn the technique of the successful American drivers. It is a race that is not usually to the swift and like Le Mans and the Mille Miglia it pays to drive to finish and not to succumb to the temptation of the substantial cash prizes offered to the leader at 100 mile intervals during the race. It is interesting that of the 16 makes that competed in the 1913 race only Sunbeam and Peugeot were still represented in the 1922 event. Sunbeams finished "in the money" (first 10 places) in all five races, Peugeot and Duesenberg in four of them, Stutz and Maxwell in three, Delage and Mercedes in two. No other British make competed. If there were no laurel wreaths for the Sunbeam teams at least they won 11,700 dollars!